Flowering shrubs add beauty to any lawn, often doing double or triple duty by attracting wildlife, providing fall foliage, stabilizing soil and acting as a wind break. In many instances they also protect against soil erosion, standing up to both heavy rainfall and drought conditions. Given the sheer number of consumer choices, whittling down the decision about the best flowering shrubs for Washington is easier when a couple of different factors such as size, flower color or maintenance requirements are considered. Seasonal flowering patterns allow landscapers multiple choices for year round yard color. 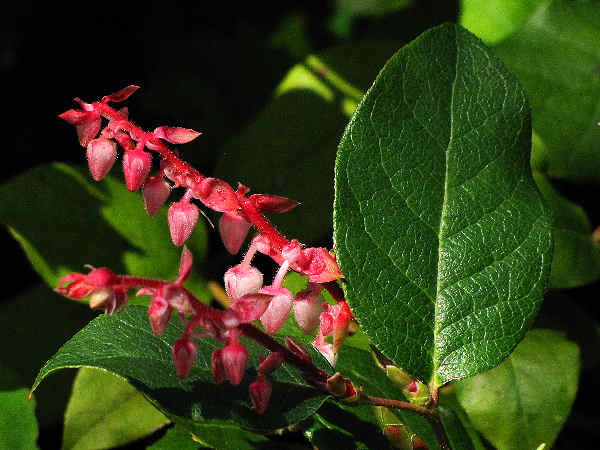 Here’s one take on the top ten flowering shrubs for Washington theme. Roses are presented separately. Without a doubt, and it’s really a no brainer, the number one flowering shrub for Washington would be the Rhododendron. North America hosts approximately three dozen native Rhododendron. Colorful spring blossoms make them popular landscape choices. 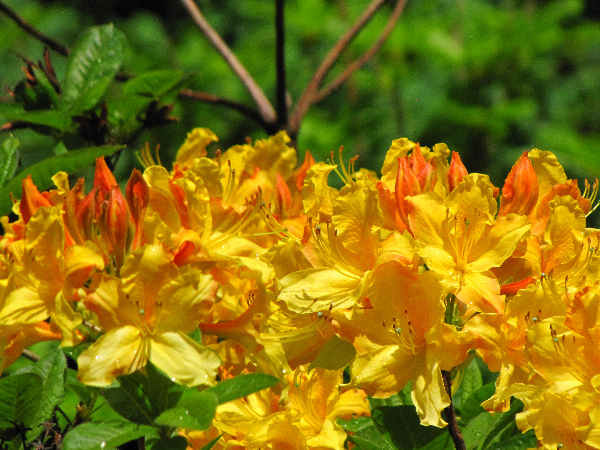 Their popularity also translates into an abundance of Azalea and Rhododendron hybrids on the market suited to most all growing conditions. Yes, of course, the Pacific Rhododendron (Rhododendron macrophyllum) is the official state flower. That’s reason enough to plant one in the yard. Wait, there’s more. They are hardy plants that can reach tree size (over twenty feet). They produce late spring flowers. 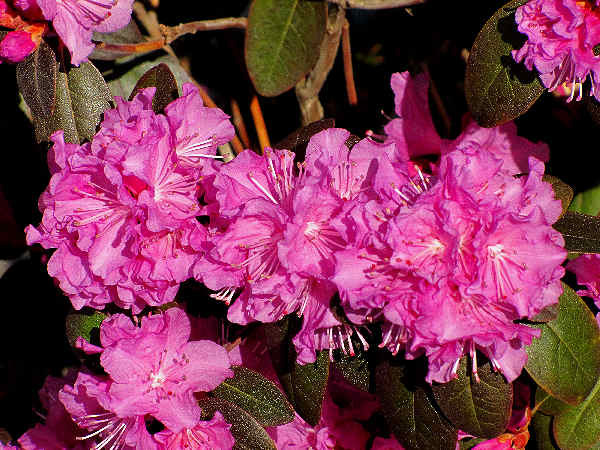 Additionally, a variety of smaller Rhododendron shrub varieties are also sold on the commercial market. Often times the choice of plant comes down to consumer flower color preferences. All members of the Rhododendron genus, including Azaleas, are considered poisonous. Honey produced from Rhododendron nectar is also toxic and often referred to as mad honey. 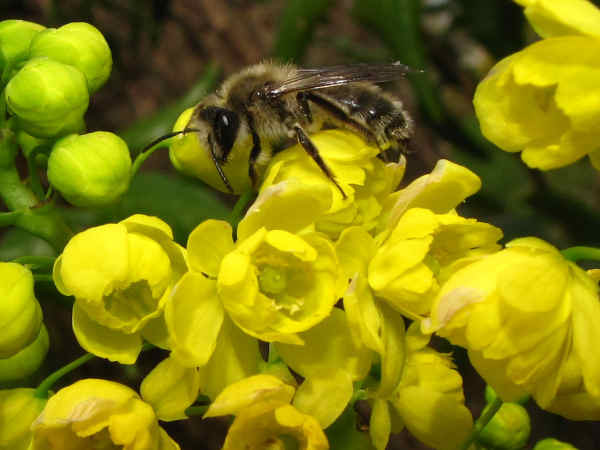 Evergreen shrubs that flower and/or produce berries remain popular because they often attract wildlife and provide a nice aesthetic look to the yard. Shrubs in the Barberry family, (Berberidaceae) attract consumers interested in larger shrubs for defining natural boundaries and providing natural shelter. One popular barberry, the Oregon Grape (Mahonia aquifolium), pictured above, grows with thick, waxy leaves. Clusters of yellow flowers bloom early in spring for this official state flower of Oregon. Native Americans used the roots and berries for food and medicinal purposes, although the berries lean to the tart side. Yes I know it’s got the name Oregon in it. It’s still a nice flowering shrub for those not keen on interstate rivalries. For everyone else, there’s still a great group of choice flowering shrubs to consider. How about Camellia? They are another of the very popular broad leave flowering shrub that tend to cheer up everyone starting during their late winter and early spring blooms. It’s exactly the time homeowners are looking for a little color to break up the usually less than colorful winter season. 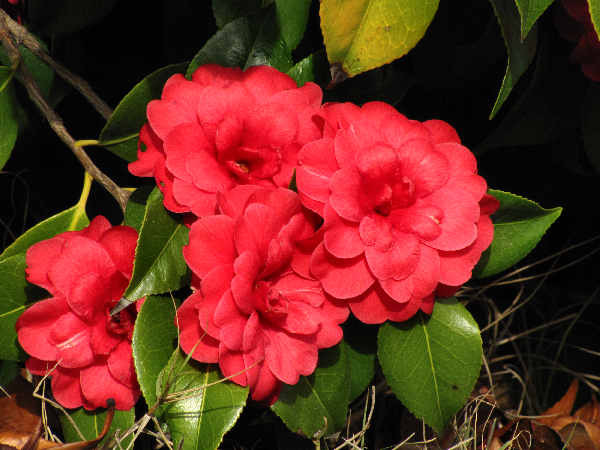 A few Camellia varieties grow to tree height, most grow to large shrub height (6-9 feet). Some small varieties do very well as container plants placed on the patio. They take well to pruning and flower prodigiously. 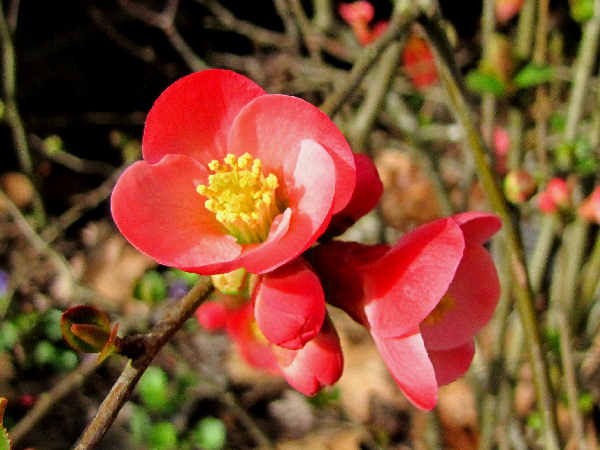 Washingtonions who like the look of a woody stem shrub often take to Flowering Quince. They are early spring bloomers and the woody branches fill out with small green leaves through the season. Flowering Current is also a great flowering shrub for Washington. In fact, four different Currant plants are commercially available to satisfy the needs of different home owners. They consists of small to tall deciduous trees and shrubs, that produce flowers and berries. 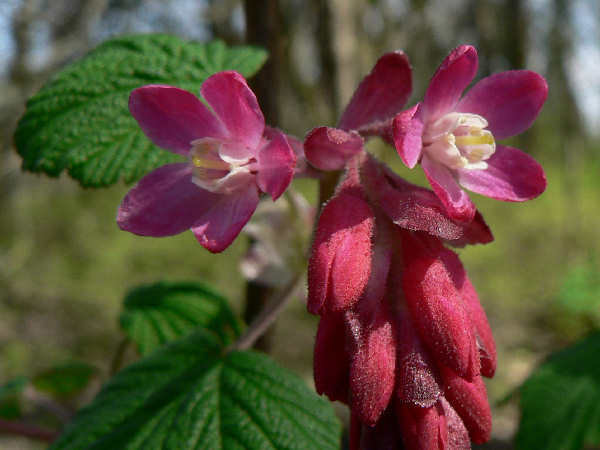 Red-flowering Currant (Ribes sanguineum), a native Pacific Northwest species, grows along coastal areas from British Columbia, south to central California. Well known as a hummingbird bush. The red flowers loom in early spring, making them a first stop for the hummingbirds following the Pacific Flyway on their northern migration. Many of the plants in the Ribes genus are berry plants, including the Red-Flowering Currant. While its berries are edible, a quick internet search found mixed opinion about their taste. 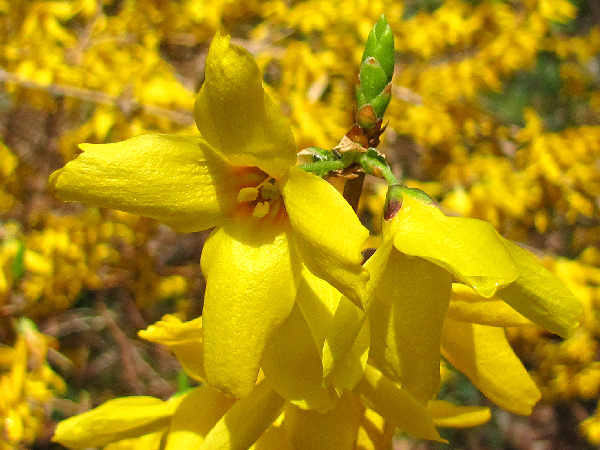 Forsythia may go unrecognized throughout most of the year, however, come early spring their long thin branches filled with yellow flowers can be a head turner. Many varieties can reach ten feet in height or more, so their winter dormancy provides a good time for pruning to ensure they fit their allotted landscape space. Salal (Gaultheria shallon), a hardy, native shrub, grows in and around coastal forest areas along the entire West Coast. The small pink bell flowers stand out against the large green leaves, making it a very pretty plant. The large leaves stand up against wear and tear, making them excellent background leaves for floral arrangements. Adding the fact that the plant’s berries are edible, means Salal practically sells itself as an excellent native shrub for any western garden. The plant can grow up to five feet in height. However, trimmed properly, it can also thrive as a smaller shrub. 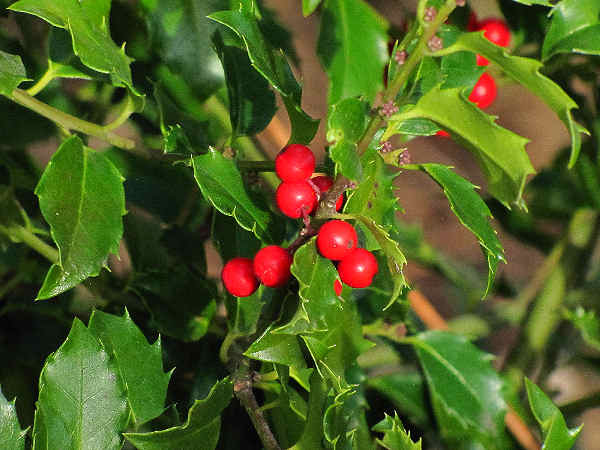 Many Washington consumers also think holly (family Aquifoliaceae) when they consider evergreen shrubs, especially the plants of the Ilex genus, with pointed leaves and red berries. Close to forty different Ilex species grow in eastern North America. The English Holly (Ilex Aquifolium), now naturalized in the wild, is the dominant Western species. Many Ilex shrubs are associated with year end holiday season because the berries tend to be in bloom during the season and used for decorative purposes. 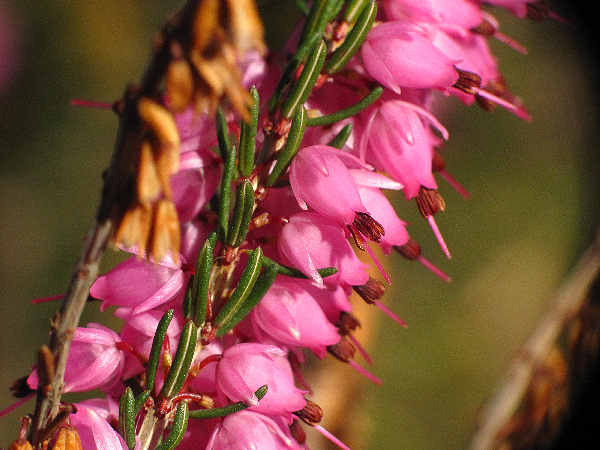 Higher altitude areas along the Cascades and Eastern Washington, for example, might choose among a variety of low growing evergreens with flowers. Six different Phyllodoce species, with pink, purple, blue and yellow blossoms, grow in the boreal forests of the northern climates, including Washing. They grow well at most altitudes. The picture highlights the plant’s thin, evergreen leaves. The varieties of deciduous shrubs available on the market for home landscaping purposes continues to expand. Varieties from five plant families, Ceanothus (California lilac), Currant Grossulariaceae), Oleaceae (olive family), Honeysuckle and Verbenaceae remain consumer favorites. A quick end note: The varieties of deciduous shrubs available on the market for home landscaping purposes continues to expand. Varieties from addutuibak plant families, Ceanothus (California lilac), Oleaceae (olive family), Honeysuckle and Verbenaceae remain consumer favorites and great flowering shrub choices for Washington.